I adore #Influenster! They've allowed me to try so many brands and product that I wouldn't have know about otherwise. #VichyUSA is one of those! I'm always a bit leery trying new skin products. My skin.... oh my skin. It has so many problems and it's temperamental in a bad way! I have wrinkles and lines, acne, large pores, sagging skin, the works! If I use something for aging it breaks me out. If I use something for breaksouts it dries my skin out. If I use something for dryness it irritates my skin and causes burning. And scented products? Fugetaboudit! Our ultimate skin-firming, anti-wrinkle duo helps you take control skin aging signs with targeted repair that works around the clock. 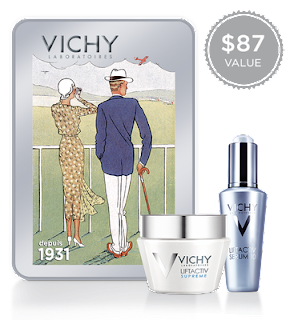 This limited-edition value set combines a full-size LiftActiv Serum 10 + LiftActiv Supreme to help smooth the appearance of wrinkles, visibly firm skin, and restore a youthful radiance.